Margaret (Peggy) Wilson ORMSBY was born on 14 September 1904 in Brickrow Farm, St. Quivox, Ayrshire, Scotland, the sixth child and fifth daughter born to John ORMSBY and his wife Helen Ramsay MUIR. Two children had already died by the time Margaret arrived. I have not been able to determine the source of her middle name ‘Wilson’, although James WILSON was the parish minister at St. Quivox for at least thirty years and had married Margaret’s parents John and Helen Ormsby in 1894. It is possible that James Wilson was a close family friend as well since on October 24, 1924, he officiated at the marriage of Margaret’s sister Jane (Jean) Muir ORMSBY to James Crawford MCGUIRE. [see post 16 November 2012]. Margaret, 20, (photo below) was witness at the marriage. The photo right [Margaret, October 24, 1924] was sent by Margaret’s mother Helen to her sister Jane (Jean) (MUIR) WATSON who lived in Saskatchewan, Canada. The photograph is now in the collection of an Ormsby family descendant who still lives in Ayrshire, Scotland. Margaret never married. She worked as a live-in housekeeper / cook for many years, primarily for a well-to-do elderly bachelor. Apparently it was a position that financially allowed her to indulge in her enjoyment of fashion as family stories indicate that she “had a sense of style and always wore lovely clothes”. When the elderly bachelor died he left Margaret a bequest sufficiently large that she was able to buy or build a small home for her retirement. About 1947 when her brother Henry (Harry) ORMSBY married, Margaret decided that it would be best if Harry and his bride Annie Young SPROAT had Brickrow Farm to themselves without the presence of their mother Helen who had become domineering and overbearing woman. Margaret took a housekeeping job in East Kilbride and took her mother with her. After her mother’s death in 1951, Margaret continued to work as a housekeeper. On her retirement Margaret lived at her home at 3 Allenfield Road in Ayr. Family ties were important to her and Margaret was a letter writer. From family photos and letters I know that, although she never travelled to Canada, she maintained contact with her Saskatchewan cousins [children of Jane MUIR and Thomas WATSON] and they visited her whenever possible. She may also have been in touch with her cousins in New Zealand (children of Richard Steele ORMSBY), and Australia (children of James Henry ORMSBY), unfortunately no records or letters have been found to indicate this was the case. Family members from Canada did stay in touch and visited whenever they were in Scotland. 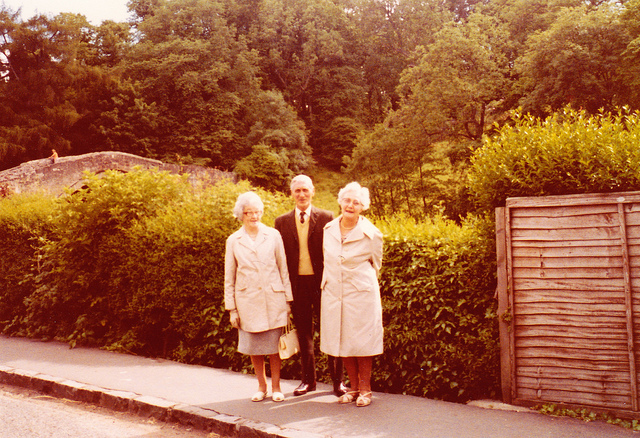 Photo left: Annie, Harry and Margaret Ormsby, taken Alloway, Ayrshire Scotland in 1977 by Elsie (Watson) Slater from Winnipeg, Manitoba. Brig’O’Doon in the background. See Donald Slater’s Flickr site http://www.flickr.com/photos/palaeoecogeek for this an other family photographs. Photo left: Margaret (left) and her sister Jean Muir (ORMSBY) McGUIRE (right) at 3 Allenfield Road, Ayr, with Canadian cousin Samuel Acton WATSON, from Victoria, British Columbia. Sam’s father, James Muir WATSON, was a 1st cousin of Margaret and Jean. This visit occurred about 1982. Photo above and below are from the author’s collection. Photo left: Thomas (‘Tom’) Watson ACTON, from Saskatchewan, visited Margaret in 1984, the visit referred to in the letter below. Tom’s mother Helen (Nell) McNab (WATSON) ACTON and Margaret were 1st cousins. I am sure you must think I have departed this world! I am so late in saying ‘thank you’ for your lovely Christmas card and a previous letter. I am only now starting to write. I had a week in hospital in early December, and had the cataract removed from my right eye. The op. has been a success, but on returning home I took a very lazy fit. They say “Some people sit and think”, but I just sat. I am told that I had left it too late having my first experience of an anesthetic at eighty! I feel more active now but am plagued with a bad cold. We are having our first snow of the winter and it is bitterly cold, though nothing like in the south of England. It has been quite a year. This miners’ strike has caused such an upheaval. Luckily, I had decided to finish with my coal fire and will not use it again though I do miss it. Ann [Annie ORMSBY, Harry ORMSBY’s widow] has had another spell of backache and confined to the house. I have not been able to visit her for two days but we have long chats on the phone. In late summer she had treatment from a specialist near Edinburgh and was happy to think she had been cured but alas! I think she will return for more treatment when the cold season ends. I do hope too that she can find a home in Ayr during the year. I have nice kindly neighbours here and I would be tempted to go house hunting myself. I have no quarrel with my present house but the garden is just a bit too much nowadays. However will give it another summer and find out if I can manage. I do hope you both keep well and you are coming to terms with retirement! Perhaps you will fancy another long holiday as you had last summer. Sorry my writing is so poor – I have still to get new spectacles. My thanks and good wishes to both. Letter above is now in the collection of an Ormsby family descendant who still lives in Ayrshire, Scotland. Margaret, 88 years old, died on 11 June 1992 in Biggart Hospital, Prestwick, Ayrshire, Scotland.